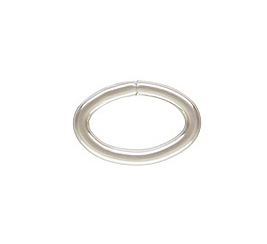 Sterling Silver Heavy Open Oval Jump Ring. 16ga, 9x6mm. This jump ring features a "Click & Lock" mechanism for easy and secure closure, with no soldering required (similar to a snap-ing jump ring. Anti-Tarnish treatment. Made in the USA.